The blood was hardly dry from the slaughter of nearly a thousand pro democracy protesters by the Chinese Army when Conservative Trade Minister Micheal Hesteltine headed the largest Western business delegation to ever visit Beijing. Then as always trade was promoted as the way to strengthen the liberal movement within the hard-line regime. So what if Gadaffi wins back control in perhaps a short but bloody strike on the protesters? 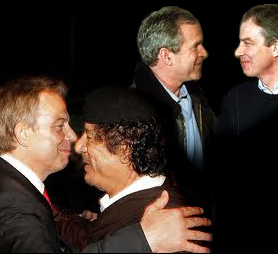 Will the Middle East Peace Envoy, Mr Blair be hugging the Colonel once more, will BP be lobbying for a return to business as usual? The World’s leaders are lining up to condemn the man but in two years time will they be lining up to do business with him?